Athens, Georgia (March 22, 2019)--Ambrosia beetles are swarming south Georgia pecan orchards and farmers should take precautions now, according to Angel Acebes-Doria, pecan entomologist with University of Georgia Cooperative Extension. Growers can monitor for beetle activity by setting out traps and scouting for infestations, prioritizing trees in low-lying or flooded areas. If growers detect beetles and suspect tree damage, immediate action is required in order to save the tree. If trees are attacked, producers need to apply pyrethroids at the trunk of the tree. The more often a tree is attacked by the beetles, the less likely that tree is to survive an attack. �Some farmers will spray around the perimeter of the orchard, in the area between pecan trees and the woods and maybe a few rows into the orchard. If you have 600 or 700 acres, it�s just not practical to spray the whole orchard,� said Tucker Price, Cook County Extension coordinator. 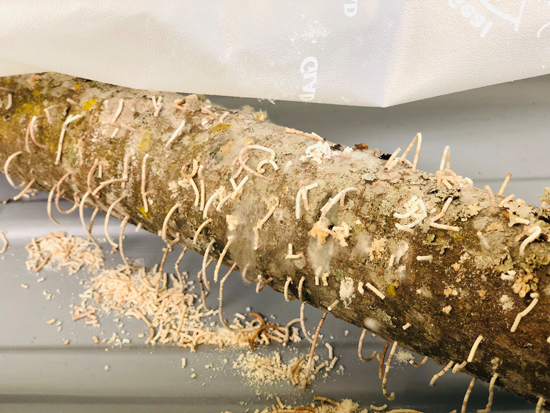 Ambrosia beetle activity is identifiable by the toothpick-sized sawdust tubes they leave sticking out of holes bored in pecan trees. Some growers have taken preventive measures by spraying along border rows once beetle activity has been detected. Trees that are most vulnerable are young and stressed, especially those under flooded conditions. Georgia�s increased rainfall this winter has left many south Georgia orchards susceptible to damage. Trees near wooded areas are also vulnerable because that is the beetles� natural habitat. Producers can identify beetle activity by the toothpick-sized sawdust tubes the beetles leave sticking out of holes bored in pecan trees. Acebes-Doria said beetles have been found in pecan orchards in Brooks, Cook, Crisp and Irwin counties. Pecan producers are strongly encouraged to set out traps, which help to indicate when beetles are active. � Get a piece of wood that is approximately 3 feet long with a 3- to 4-inch diameter. Using an 11/16-inch drill bit, drill a 4- to 6-inch deep hole into one end, without going all the way through the piece of wood. � Pour ethanol into the hole. Grain or denatured alcohol also works. Use a wine cork as a stopper. � Drill an eye hook into the wood so that you can hang it above the ground. � Deploy traps along the boundaries that separate orchards from wooded areas. Price has heard from several producers in Cook County who have seen beetle activity. One bright spot for Georgia producers is that spring is almost here. Once trees begin to leaf out, normally around late March or early April, the window for vulnerability decreases. Most trees are currently dormant but are preparing to produce leaves. For more information about ambrosia beetles or any other pecan-related topic, visit https://site.extension.uga.edu/pecan/.